Here is the full list of Tax measures included in Budget 2015. Some, but not all, of these measures were unveiled in Minister Noonan’s Budget Speech to the Dáil this afternoon. 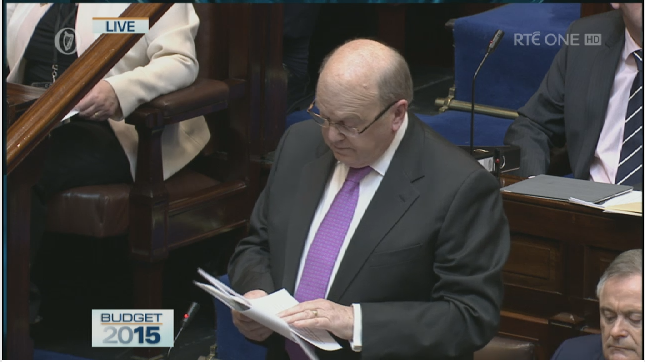 Michael Noonan announces Budget 2015. The standard rate band of income tax increases by €1,000 from €32,800 to €33,800 for single individuals and from €41,800 to €42,800 for married one earner couples. The higher rate of income tax falls from 41% to 40%. Incomes of €12,012 or less are exempt. Self-employed income in excess of €100,000 faces a USC charge of 11%. There are now 8 different bands of USC, a tax which is now more complex than ever before. The excise duty on a packet of 20 cigarettes rises by 40 cents (including VAT). A a pro-rata increase on other tobacco products will also take immediate effect. The excise duty on roll-your-own tobacco rises by an additional 20 cents (including VAT) per 25g pouch, again immediate effect. Betting Duty is being extended in 2015 to remote operators and betting exchanges. are being extended to 31 December 2016. The special relief on Excise Duty, which cuts the standard rate of Alcohol Products Tax by 50% on beers from microbreweries producing 20,000 hectolitres or less per annum is being extended to microbreweries produce 30,000 hectolitres or less per annum. A 30 day deferral of excise duty on mineral oil is to be introduced. The excise rate for Natural Gas and BioGas as a propellant (ie transport fuel) will be set at the current EU Minimum rate and this rate will be held for a period of eight years. The threshold for the artists’ exemption from Income Tax is being increased from €40,000 to €50,000. The Exemption is also being extended to non-resident artists, who are resident in another EU/ EEA State. The Foreign Earnings Deduction is being extended for a further 3 years until the end of 2017 and is now widened to include Chile, Mexico and certain unspecified countries in the Middle East & Asia. The number of qualifying days abroad is being reduced from 60 to 40. The minimum stay in a country is cut to 3 days and now includes travelling time. The Special Assignee Relief Programme is also being extended for a further 3 years, until the end of 2017. The upper salary threshold is being removed. The residency requirement is being amended to only require Irish residency. The exclusion of work abroad is also removed. The requirement to have been employed abroad by the employer is being reduced to 6 months. The EII is being amended “to raise company limits, increase the holding period by 1 year and include medium-sized companies in non-assisted areas and internationally traded financial services”. These measures are subject to EU approval. Hotels, guest houses and self-catering accommodation will remain eligible for a further 3 years, and the operation and management of nursing homes will be included for the next 3 years. The scheme is being rebranded as “Start-Up Relief for Entrepreneurs” (SURE) and being widened to included those who have been unemployed up to 2 years. The threshold for exempt income under the Rent-A-Room Scheme is being increased from €10,000 to €12,000 per annum. Tax relief at 20% will be provided on water charges, up to a limit of €500 per annum. Relief will be given annually for charges paid in the previous tax year. properties “owned by landlords subject to income tax”. The CGT incentive relief, which provided Capital Gains Tax exemption in respect of the first 7 years of ownership, for properties purchased between 7 December 2011 and 31 December 2014 will not being extended beyond 31 December 2014. Where property purchased in this period is held for seven years, the gains accrued in that period will not attract CGT. The 80% Windfall Tax on land disposal gains & land development profits attributable to planning decisions is being abolished from 1 January 2015. The amounts of long term land leasing income exempt from Income Tax rises by 50%. A new threshold is being introduced for lease periods of 15 or more years, with income of up to €40,000 being exempted. The long term land leasing income exemption is also being extended to companies which lease land. The 40 years of age threshold for leasing relief is being abolished. Income averaging, which allows full-time farmers to calculate their income tax position based on rolling average earnings over 3 years, will now be revised to calculate incomes over 5 years. It is also extended to farmers with other income from “on-farm diversification”. The farmer’s flat-rate addition rises from 5% to 5.2%. This addition VAT-unregistered farmers for VAT incurred on their farming inputs. The deadline for Capital Gains Tax relief for farm restructurings is being extended to 31 Decemeber 2016. CGT Retirement Relief can now apply to land that has been leased for up to 25 years in total (increased from 15) ending with disposal. Retirement Relief is being extended to land currently let under conacre (11 month letting) and which is disposed of by 31 December 2016 or enters a long-term (5-25 years) letting arrangement (ending with disposal) by that date. to individuals who are not active farmers but who lease out the property on a long-term basis for agricultural use to active farmers. In addition, 5-35 year Agricultural leases to active farmers will be exempt from Stamp Duty. Consanguinity relief, which halves the applicable rate of Stamp Duty, will be extended for a period of three years for transferors under 65 years old, where the transferee is an active farmer. The 2003 base year restriction for the R&D Tax Credit is being removed from 1 January 2015. The limited Corporation Tax relief on trading income (and certain capital gains) of new start-up companies in the first 3 years of trading is being extended until the end of 2015. This 80% restriction on aggregate capital allowances in respect of intangible assets (and any interest expense incurred on borrowings to fund the expenditure) will be removed. The Accelerated Capital Allowances for Energy Efficient Equipment, which incentivises companies to invest in energy efficient equipment, is being extended to the end of 2017. A new relief from DIRT will apply on savings used by first time house buyers towards the deposit on their first home. The Dept of Finance Summary of 2015 Budget Measures is here.